Did you know that light is a nutrient and many of us are actually deficient in it? But there is a simple and powerful remedy for it called Red Light Therapy. 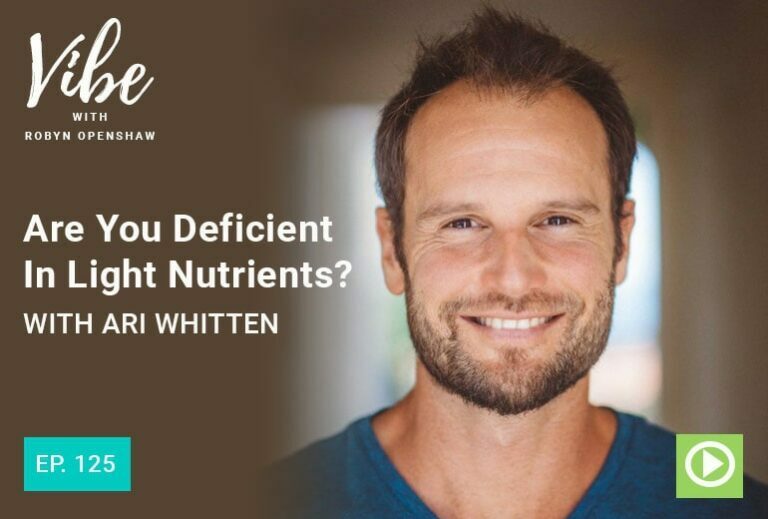 Health and nutrition expert, best selling author, and researcher Ari Whitten shares with us in this episode just how important it is to get this great light nutrient into your life. No matter the illness, injury or issue you or a loved one may be struggling with, Red Light Therapy can help. Learn why and how this box of lights can benefit you personally and how to get a great deal on having this ultimate tool towards health and healing in your home and life. Robyn: Hey everyone. It’s Robyn Openshaw and Welcome back to the Vibe show. Today we’re going to talk about light frequencies as missing nutrients in most Americans lives. And I’m inviting someone back on the show who I’ve had twice before. I think you probably really enjoyed his comments, expert Ari Whitten to talk about his new book, “The Ultimate Guide to Red Light Therapy”. The subtitle is pretty long, it’s “How to use red and near infrared light therapy for anti-aging, fat loss, muscle gain, performance enhancement and brain optimization.” I’m sure that all of us could use one or more of those things. But just to reiterate, even though Ari’s practically a regular on this show, he’s a bestselling author, a nutrition and lifestyle expert, has a degree in kinesiology and completed coursework for a PhD in clinical psychology, and he is the author of “The Energy Blueprint” system. So he’s fascinated by mitochondria. He’s fascinated by how the body’s energy works and how we can optimize it. And today we are talking about red and near infrared light spectra and what getting that back in our lives can do for us. And what is the most inexpensive, accessible way to get that in our lives for rapid healing, for anti-aging, for better, slower aging skin and so many other things. There are literally thousands of published studies on what these spectrum of light frequencies can do for us. So obviously a great subject for the Vibe show where we talk all things vibrational frequencies. I’m very excited for you to hear from my good friend Ari Whitten again today. So welcome back to the Vibe show. My good friend Ari Whitten. Ari Whitten: Thank you so much for having me yet again. It’s an honor. Robyn: So it’s super crazy what’s happened with your book. You launched it and you didn’t make a lot of noise about this book, very nichey topic that most people know pretty much nothing about, “The Ultimate Guide to Red Light Therapy”. So tell us why you wanted to write a book about this super nichey subject. I mean, Bam, you sold like 15,000 copies of your book. Why should people care about red and near infrared light therapy? I do want to like make a quick note that one thing that blew me away as I was reading the introduction of your book, read your whole book, is that you said it absolutely belongs in the class of nutrients. It is a missing nutrient in the postindustrial age of modern America. I’m extrapolating a little bit, but is that accurate? Tell us about it. Ari Whitten: Yeah, that’s 100% accurate. So maybe we’ll get to that in a little bit after I explain what it’s all about. But, I will answer your first question. What made me want to write a book on this subject? I’ve been actually studying the subject for over 10 years now and I’ve been paying attention to the science on it. And I was geeking out on the science on this topic long before anybody knew about this topic. And before there were all these new companies emerging selling devices on the subject. Like I was literally having to go to light manufacturers and have them make me custom devices because there was no company in existence that actually made these devices other than super high price lasers. And so one of the big breakthroughs that’s happened is that, you know, the research has shown that you don’t need these high priced laser devices that are $20,000 that are in your doctor’s clinic. You can actually get all the same benefits with an at home device that’s a few hundred dollars. So this is a technology that’s been used in clinics for decades now. There’s been a huge amount of science that’s been done, over 5,000 peer review studies have been done on this in the last few decades. And the research is exploding now. It’s become a hugely popular thing. And it’s been actually used in doctor’s offices, physical therapist’s office, chiropractor’s offices for several decades now with these laser devices. But the reason it hasn’t yet gone mainstream up until, hadn’t yet gone mainstream, I should say, up until a few years ago, is simply a function of the fact that these LED devices, and the companies that make them that now exist didn’t exist. And the research hadn’t been done to know if you could get all the same benefits of the laser devices with these LED devices. And it turns out you can and you can actually get some cool other benefits that are really hard to get with the laser devices. So that’s the reason that I wrote a book on this is because I’ve been geeking out on the science on this stuff for 10 plus years. And I think it’s absolutely incredible stuff that can profoundly impact people’s lives and provide just a huge array of benefits from fighting skin aging and wrinkles and cellulite to helping people lose more fat, to getting rid of chronic inflammation, to fighting oxidative stress and aging at the cellular level, to increasing strength and endurance and muscle mass, to decreasing pain and fighting arthritis, to combating hair loss, to speeding up wound and injury, healing to fighting autoimmune diseases like Hashimoto’s hypothyroidism to optimizing your brain function and mood and fighting depression and anxiety and fighting neurological diseases like Alzheimer’s and, um, combating chronic fatigue and increasing energy levels. I mean, there’s just an amazing amount of research showing massive benefits of this technology for so many amazing things that it’s just crazy that not everyone already has a device like this. Like I phrase it like this in the book, I write it like this and I think this is a good way of getting the point across. But all of that long list of benefits that I just gave, so let’s imagine that there was a pill made by a pharmaceutical company and it was proven in scientific research and thousands of studies to help you lose fat, to fight skin aging, to combat inflammation, to improve your performance and recovery from exercise, to amplify the fat loss benefits of exercise, to improve your brain health and fight neurological disease, to decrease pain, to speed healing, to help you overcome fatigue and increase your energy levels and to do all of that with basically no side effects. If there were a pill from a pharmaceutical company that was proven to do all of that, it would be the biggest blockbuster drug of all time. It would be an incredible multibillion dollar drug that you’d go to your doctor and your doctor would literally tell you that you’re insane if you’re not taking this drug because it’s just, it’s got so many incredible benefits. There’s no side effects. Why would you not do it? You’d have to be stupid not to do it. Right? So that is actually the case that we have with the red light therapy. It’s just not a pill from a pharmaceutical company. It’s a light therapy device. Robyn: Fascinating. So I remember reading about, I think seven studies that you referred to just on the issue of thyroid disease alone and how a few of them showed and fairly small studies as I recall, that just from this light therapy alone, people were able to get off medication. Do you have any recall of some of that data that you can talk about that, cause it’s a frequent subject on this show, the epidemic of thyroid disorder. Ari Whitten: Yeah, absolutely. So one of the things that happens in Hashimoto’s, hypothyroidism or autoimmune hypothyroidism is basically the immune system’s attacking the body’s own thyroid gland and destroying the thyroid tissue. And eventually you get low thyroid hormones as a result of that and ultimately destruction of the actual thyroid gland itself. So, you know, the typical treatment for this, um, I mean in conventional medicine is you just do thyroid replacement therapy. So you just take a pill with thyroid hormones to replace whatever your thyroid isn’t making. There is no treatment that they have that you know, can stop the progression of or slow the progression of the destruction of the thyroid gland or shift your immune system so it’s not attacking your thyroid gland as much. And all they just do is they just replace your whatever hormones are not being made by your thyroid with a pill that has those thyroid hormones. Um, within natural health circles, holistic health, functional medicine circles, the approach is thankfully more sophisticated and they’re addressing nutrition and lifestyle factors, but often even those people are unaware of the research on red and near infrared light therapy and how research has shown amazing benefits in this context. So, um, there was a 2013 placebo controlled study with people with hypothyroidism and they showed dramatic reductions in thyroid antibody levels and actually measuring these in the blood and increases in thyroid hormones. And 47% of patients were able to stop their medication completely. Okay. Stop taking oral thyroid hormones. And they even did a follow-up treatment nine months later and found that the effects were still evident. Um, they even did a five year follow-up, which found that the, um, the benefits were still present in many of these, or a portion of the benefits were still present, but they recommended periodic sort of refresher treatments. You know, naturally, it’s not like you just do this treatment one time and then you just forever get permanent benefits. But the benefits were lasting surprisingly long in the majority of these. There’s also research, there’s other studies from 2010 and 2003, um, a number of studies from Russia as well that have shown similar results. One study found 38% of study participants could reduce their hypothyroid medication dose and 17% being able to stop their medication altogether. Uh, and then there’s several other studies that have shown improvements in thyroid hormones, decreases in thyroid antibodies, and so on. So we have this amazing therapy that is not being used in conventional medicine that has been proven in numerous studies to reduce the antibodies and the destruction of the thyroid gland. And it does that by shifting the macrophage type in the immune system from an M1 to an M2 macrophage type. And basically what that does is it shifts from a more attacking, aggressive, inflammatory type of macrophage to a less inflammatory and aggressive type of macrophage that is not aggressively attacking the thyroid gland. So it’s actually shifting the way the immune system is interacting with the thyroid gland itself. And that’s pretty important because this is an autoimmune condition. So, um, it’s also reducing inflammation directly and it’s stimulating the Mitochondria in the thyroid gland to produce thyroid hormone more effectively. And the research backs all of that up and shows really profound benefits in this context. Robyn: Yeah. So I kinda jumped ahead and went specifically to a condition that I’m super interested in that we talk about a lot here. But let’s back up for a minute. Why are we missing red and near infrared spectrum in the light we’re exposed to? And why is it that light has such a dramatic impact on our health? Ari Whitten: That is a great, great question. And the answer is that most people have no clue about light. Unfortunately, we think of light as the absence of darkness or the opposite of darkness sort of. You go into a room or a space and it’s dark. So we have a light, you know, we can switch a light switch on or have a flashlight or street lights or turn on our head lamps on our car and we create light. And light is the absence of darkness or the opposite of darkness. It lights up a room so it’s not dark anymore. That’s what people think of when they think of light. What people don’t realize is that light and various wavelengths of light have absolutely profound effects on our bodies and the function of our cells. And this sounds like a wacky idea to some people, but there’s actually thousands of studies on this topic and um, and most people are just simply unaware of the role of light in human health. And there’s a number of facets to this and some people will connect the dots on some of these things and realize some of the layers of the story, um, that are sort of more well known, but there’s still a lot of layers that are not well known. So I’ll mention, you know, I like to think of it as sort of five main wavelengths of light that affect our body in different ways. So one is UV light and that affects our body actually through a variety of mechanisms. But the main one is by interacting with our skin and creating this synthesis of vitamin D and vitamin D regulates the expression of over 2,000 genes in our body and plays a number of extremely important roles. It’s actually not a vitamin, it’s a hormone and extremely important. So we synthesize that, we make that in our body and we’re designed to make that predominantly by our skin being exposed to light from the sun in the UV ultraviolet spectrum. Then we have blue light. Light in the blue wave lengths and to some extent the green wave lengths, which feeds into our eyeballs and feeds back into our brain into a part of the brain in the hypothalamus called the suprachiasmatic nucleus. And that’s where we have a quite literal 24 hour clock. It’s a biological clock that regulates all sorts of neurotransmitters and hormones that control our sleep wake cycles that impact on our metabolism, our appetite, impact on hormones that regulate energy and neurotransmitters that regulate mood and alertness. And all sorts of other things, I mean, there’s an enormous body of literature around the Circadian Rhythm, you know, even in how it affects liver function and brain function, all sorts of things. So circadian rhythm is a huge, huge aspect of how light affects our body. Uh, and we, you know, we talked about this in another podcast. Um, but light is the primary, it’s called a Zeitgeber. It’s the primary signaler or controller, the primary environmental input that affects how our circadian rhythm operates and therefore affects how dozens of neurotransmitters and hormones are being regulated. So that’s two of the mechanisms. Then we have, there’s actually a variety of other mechanisms, like weird mechanisms. So for example, UV light leads to the release of endorphins at the level of the skin, which then feed into the blood and then, um, create the synthesis of a neurotransmitter in the brain called glutamate. So they’re literally, so what’s happening from UV light at the level of the skin can then affect neurotransmitter levels in your brain. So, pretty cool stuff. There’s research showing that light impacts the synthesis of other neurotransmitters and the signaling of other neurotransmitters. Like serotonin and dopamine, and by virtue of effecting the Circadian Rhythm, also another neurotransmitter called Gaba, which is really important in combating stress and de-exciting the brain and getting it ready for sleep. Another layer to this story is far infrared light or far infrared energy. It’s not visible to the human eye, but when we’re out in the sun and we feel heat on our body from the sun’s rays, that’s primarily far infrared energy that is creating heat. And one of the things that that does is it affects microcirculation in our body. It dilates blood vessels, it stimulates the release of nitric oxide and helps increase circulation. And if you have enough of it and it heats your body enough, uh, like for example, in the context of a far infrared sauna or the sun on a really hot day, then it stimulates sweating and detoxification through that pathway. Then the other two wavelengths of light, are red light and near infrared light. And these are on the electromagnetic spectrum of light. All of these wavelengths are on the electromagnetic spectrum. So if people remember back to their, you know, sort of, um, elementary school classes where they learn the colors of the Rainbow, roygbiv. It’s actually sort of, if you flip that and you go, you know, the way the electromagnetic spectrum is structured from lower wave lengths to higher wave lengths. Basically it’s violet, indigo, blue, and then green, yellow, orange, red. Those are the visible wavelengths of light. And then once you get out of the visible wavelengths of light, then you get into near infrared wave lengths and then you get into far infrared wavelengths. And then the really long wavelengths are things like radio waves, microwaves and then radio waves and that sort of thing. So if people want to do a Google image search for the electromagnetic spectrum, they’ll see what I’m talking about. But it starts, the whole electromagnetic spectrum starts with things like gamma rays and x rays and then goes into ultraviolet light and then the visible spectrum Roygbiv of wavelengths of light that humans can see with our eyes. And then it goes into near infrared far infrared, microwaves, radio waves and so on. So hopefully I’ve explained that in a way that people can grasp otherwise, do a Google image search. All of these wavelengths that I just mentioned exist on this electromagnetic spectrum and they interact with our body through different mechanisms. So what I’m mainly talking about with this book is about, is about red wave lengths of light and near infrared wavelengths of light. And those have absolutely profound effects on our body. They unlike UV light or blue light, which just gets stopped at the level that skin they penetrate into our body, they can penetrate inches into our body and they interact directly with our cells. And specifically they do a few things at the Mitochondria level and we can geek out on mechanisms as much as you want. But I’ll sort of quickly summarize the basic idea of what they do. They stimulate your Mitochondria. There’s a part of the mitochondria that is literally receptive to light photons and it’s, you know, sort of basically sensitive to red and near infrared light photons for the most part because those are the ones that penetrate most deeply into the body. And it takes those photons in and it turns out that your Mitochondria, which are your energy generators in your cells, the powerhouse of the cell, the thing that powers and produces energy that allows those cells to function, um, it takes in light photons and the Mitochondria can produce more energy as a result of that. So most people don’t realize it. We think of plants, you know, plants can photosynthesize they can take in light energy from the sun and sort of use that energy to, you know, produce their own energy. But humans don’t think, don’t realize that we also can take in light, we can’t photosynthesize but our cells do take in light and do respond to them in a way that our mitochondria actually produce energy more efficiently as a result. Robyn: Okay. So I want to just mention my experience with this because I got your book and you’ve, like you said, been studying this for 10 years. How many studies have been published about the health benefits of red and near infrared? Is it over 3000? Ari Whitten: It’s actually over 5,000. I say over 3,000 to be just really conservative, but it’s actually over 5,000 if you include like the Russian studies. Robyn: Okay. Yeah, because I thought I remembered that from reading the book several months ago when it came out that there were over 3,000 studies and I think that will be shocking to people listening to this podcast. So I was super intrigued by your research on it and I got a device that was $2,500 that is like the size of my door and it hung on the back of my door and I used it for a while and I had really good results with it. We could talk about those. But then I read your book and I was intrigued to learn that another of the companies that you reviewed who manufacturers these devices you really liked, their smaller and far less expensive units. And my first resistance to it was, well, if it’s smaller than I’m not gonna you know I’m gonna have to sit there and like use it for longer and put it on different spots, if I’m working on my plantar fasciitis. At the time when I got these two different units, um, I was having some pretty significant plantar fasciitis. I had been running too much plus playing tennis three times a week and I just kind of went crazy with it for two weeks. And a very old plantar fasciitis injury kicked up and I didn’t want to go through that again because when I did 10 years ago, it was literally a year of getting better. And I was like, oh my gosh, I play so many sports. I go so hard. So does my boyfriend, he’s like, you know, he does one of the martial arts, uh, he snowboards and I ski hard on the weekend. We do hot yoga. And so we don’t have room for like long term chronic injuries. I started using this thing and instead of a year of rehab and going to physical therapy and staying off it and wearing shoes, even if I got up to go to the bathroom in the middle of the night, I had to wear shoes across the floor, wear this big boot thing to bed. Didn’t do any of that. Just used this light therapy, just healing you know, tendinitis basically. It was weeks, it was weeks of using it instead of a year of total misery and a lot of suffering and pain where even walking was painful. So that was the beginning of my believing in it. We’ve had a lot of other health benefits, so much so that the less expensive unit, and this is what’s so interesting to me, usually you would think the $2,500 big huge unit would be better. But you told me, Ari, well here’s what’s great about that smaller one and you don’t take a stand in the book, buy this brand, don’t buy that brand. But you did show me some comparisons and interestingly, the less expensive smaller unit that I got, we had the best results with. And I found it to be, and this is what you convinced me of, is how versatile it is that you can kind of move it further away. Then I started, so the smaller unit, I would put it underneath the pedal on my bike and just, um, expose my heel where the plantar fasciitis was, while I rode my stationary bike in the morning. That was a lot of my very short rehab. So I went to that company because I was super excited about it. And for some stuff that my boyfriend had going on, I bought him that smaller unit for Christmas. He loves it. And so no more big huge thing that hangs from the door. But we went to the company and we talked them down from $600 to $450 for our readers because when I find something that’s really exciting and game changing for all the reasons you mentioned and more, I want to get them a deal on it. So now you can, don’t spend the $2,500 spend $450. You can check it out, you can check out their product at greensmoothiegirl.com/redlight. Okay, that’s greensmoothiegirl.com/redlight and you can get another $25 off using the coupon code. G S G all caps GSG get another $25 off the $450 price. That’s 25% off that we negotiated for you. But I also told them, I said, you know, I would not know how to use this device and I would not know how powerful it is according to the published literature had I not read Ari’s book. And so I said, I want you guys to throw that in if anybody gets this, you know, because we have a lot of followers and a lot of people are going to want this discount. I want you to put Ari’s book in the package. And they came back to me a month or two later and they’re like, well, we’ll give them a digital copy of the book. And I said, Nope, I want you to buy his book because they’re probably like me and they don’t want to sit in front of their computer and read it. So they’re doing that and they are giving a free copy of your book, which is called “The Ultimate Guide to Red Light Therapy. How to you use red and near infrared light therapy for anti-aging, fat loss, muscle gain, performance enhancement and brain optimization”. That’s going to be in your package. So as of this podcast recording at least, I can’t control what another company does, but they have agreed to put that in your package that’s 25% off plus another $25 off. So didn’t mean to make that long. But I’m actually pretty excited about what we negotiated for you. Robyn: And those are the two that I was just talking about. Actually. I like both companies and I liked both products and we had good results with both products. But Juve is the big one that is expensive. And I thought the smaller one, which is Red Therapy Co would be less powerful, and not so which is exciting. But anyways, carry on. Ari Whitten: Yeah. So they both make really high quality devices. Um, the main difference is Juve makes a wider selection of really large devices and Red Therapy Co has a smaller device that they sell. They’re about to come out with a larger device as well. The other sort of notable differences are per size and price category. The Red Therapy lights emit more light, they’re more powerful. Um, but if you’re comparing a really small red therapy device to a really large Juve that’s several thousand dollars more the Juve is certainly more powerful. Um, but per sort of price category and size of the light, the Red Therapy lights are more powerful. The Juve also, um, two other things. One is that they’re FDA cleared. The FDA clearance doesn’t say anything about the quality, the efficacy of the device in terms of what it does therapeutically. It’s mainly a legal process that you have to go through to ensure quality manufacturing and parts of the device. So they’ve technically gone through that. So that may be a factor for some people. And uh, the Juve devices are modular so you can potentially buy, you know, multiple devices and stack them and make one larger device. That’s an option. Um, the other aspect of it is that, um, the Juve devices are generally wall mounted, for the most part I think they might be changing that. And the Red Therapy device can be wall mounted or it can be free. And I actually like it free, you know, freely movable. Because what I often do is I get two of them or three of them actually. I have three of the Red Therapy devices, one of the larger ones and two smaller ones. And what I do is I will lay down with it so I don’t have to just stand up for 10 minutes next to a door, but I’ll lay down with it and I can read or watch TV or something like that. And um, actually have one device on either side of me while I’m laying down on the floor. And, um, that’s just a much more comfortable position rather than standing still for 10 minutes. I can lay down and relax and then position each light in the body part that I want to position it in while I’m in that laying position. So I just find that use to be much more flexible. Um, so those are the main differences. Both make high quality lights, but those are the notable sort of differentiating points. Robyn: Yeah. That’s really interesting that you have one and you put it on either side of you, which is going to cut your time in half relative to standing naked in front of a thing hanging on the door, which is what, you know we did. But, um, I found myself not doing it cause I didn’t really want to like strip down and stand in front of the door and with this smaller one, even though I only have one, is that I will sit in bed with it on my injury that I’m working on right now. I’m way past the plantar fasciitis but I’ve got another one that I’m working on right now. And I can sit there and read a book and I can tote it around. I could put it in my bed, I could put it underneath the pedal on my bike. It’s just infinite the ways that you can use it and how you can set it up. I also like that I can sit in my bed and read a book while it’s 18 inches from my face and neck for anti-aging purposes, which your book taught me, things like that there were super useful but then I could put like my left hand in front of it where I have a little bit of a joint injury, um, right up close to it, which I learned from you. So I’m really excited about the fact that anybody getting this 25% off deal plus another $25 off using the coupon code GSG is going to get your book because it’s a great guide for how to use your device, whatever device you get for specific purposes. And so just to close Ari, I know you need to go today, but I’ve talked a little bit about injury healing and I know that you go hard too. Your career early on was as a personal trainer to some rather famous people. Um, will you just tell us and of course you can add anything else that you feel like my audience just absolutely needs to know about this subject. But will you just talk about some of your other favorite ways of using red light therapy? Ari Whitten: Yeah, so I’ll mention, you know, I mentioned briefly about how it affects the Mitochondria. So that’s sort of the central mechanism. There are a variety of different ways and mechanisms by which the light affects the Mitochondria, but that’s sort of the central mechanism. It affects the ability of your Mitochondria to produce more energy. So here’s why that’s really important. Your brain is packed full of Mitochondria. Your muscles are packed full of Mitochondria, your organs and your glands are packed full of Mitochondria and pretty much all of the trillions of cells. Almost all of the trillions of cells in your body are packed with Mitochondria and if you can enhance the ability of those mitochondria to produce more energy, you improve the function of that thing. That’s why, you know, when I list off all these benefits, skeptical people are like, oh my gosh, that can’t possibly be true. This sounds like a panacea. How could this affect my brain health and my muscle recovery and help me lose fat and skin anti-aging? How could it do all of these different things in different parts of my body? Well, the answer is that it’s affecting your mitochondria and by affecting your mitochondria, when you enhance the ability of your cells to produce more energy in your skin, you get skin anti-aging and anti-wrinkle effects. When you do it in your brain, you get anti-depressant, anti-anxiety, anti-neurological disease effects. When you do it on your muscles, you get enhanced recovery, you get enhanced performance, endurance and strength. You get enhanced adaptations from the exercise that you’re doing. So more fat loss, more muscle gain in response to the exercise you’re doing. There’s research, for example, showing that when they compare groups who are doing the same exercise program with or without the addition of red light therapy. In addition to the exercise, there’s research literally showing double the improvements of things like fat loss or improvements in insulin resistance or improvements in muscle gain when people use red light therapy or near infrared light therapy, in tandem with their exercise. So that’s one of my favorite uses is that it amplifies the benefits. There’s research showing that by using red light therapy, you can shave off inches. There’s studies where they’ve actually shown loss of inches in the span of two or three or four weeks of using red light therapy. Um, I don’t like it just by itself doing just the therapy, but I really love it in tandem with, um, exercise training and especially diet training. That’s when it works it’s magic. Um, I mentioned brain health there’s research showing improved cognitive function, so you can literally use it to just have a brain that functions better. There’s research showing it combats depression and anxiety. There’s research in the context of Alzheimer’s disease and Parkinson’s disease showing it slows the progression and combats the neurological destruction in those diseases. There’s research showing it can be used for pain relief and a variety of different conditions, knee pain, back pain, fibromyalgia all sorts of things. Uh, as you mentioned, tendinitis and healing from chronic overuse injuries. That’s another big thing that’s been done in physical therapist clinics for a long time. That’s a very popular use. Oral health is something I haven’t mentioned. So combating gingivitis and speeding any problems in your mouth or your gums. Decreasing diabetes symptoms like peripheral neuropathy and the destruction of nerves and blood vessels in the periphery of your body and your hands and feet and things like that. Combating arthritis, improving fertility, that’s another one, an uncommon one. We talked about thyroid disease, uh, combating cellulite, combating hair loss. So, there’s a lot of incredible benefits of doing this type of light therapy. And you know, as I said before at the beginning of this, if there were a pill, whether a supplement or a drug for a pharmaceutical company that could do all of the things that I just listed off all of these amazing things that science has actually proven that red and near infrared light therapy can do, it would be just be a no brainer. Your doctor would literally tell you that you are nuts if you’re not doing this. Robyn: Yeah. Thank you for that. Really great recap. Um, both Ari and I are really excited about this as something to add to this weird toxic deficient modern lifestyle. It’s a good way to get some of these benefits into our life even though we live indoors and that’s new in the modern industrial age. Just to recap, if you just wanting to read then, if you want to start there, rather than getting your own red light therapy device, get Ari’s book. It’s called “The Ultimate Guide to Red Light Therapy”. You can get that anywhere books are sold. You can get it on Amazon. If you’re ready to get a red light device. The one I like best is now $449 at greensmoothiegirl.com/redlight. In addition to that, 25% off, you get another $25 off if you use the coupon code G S G and they throw in a copy of Ari’s book, which will save you 16 bucks or whatever. If you want more from Ari, I wouldn’t be surprised if you do because he is the guru on how to maximize your energy. He was talking about Mitochondria, it’s not something we talk about as much as he does on his platform, but go check out his work. There’s a free video masterclass on “The Energy Blueprint” and it’s at greensmoothiegirl.com/energyblueprint. So thank you so much for again sharing your knowledge with us, Ari Whitten. Ari Whitten: Thanks so much for having me Robyn.